The U.S. economy contracted modestly in the fourth quarter as weak overseas economies and government spending cuts weighed on GDP. Although the decrease was unanticipated, it has little impact on the trajectory of the slowly expanding economy. Fourth quarter political wrangling over the fiscal cliff, spending cuts and the debt ceiling raised corporate caution and mildly stifled hiring. This, in turn, dampened consumer spending and limited growth. With political wrangling over fiscal policy likely to drag into the second quarter, the economy will continue its slow expansion through early 2013, followed by stronger gains in the second half of the year. 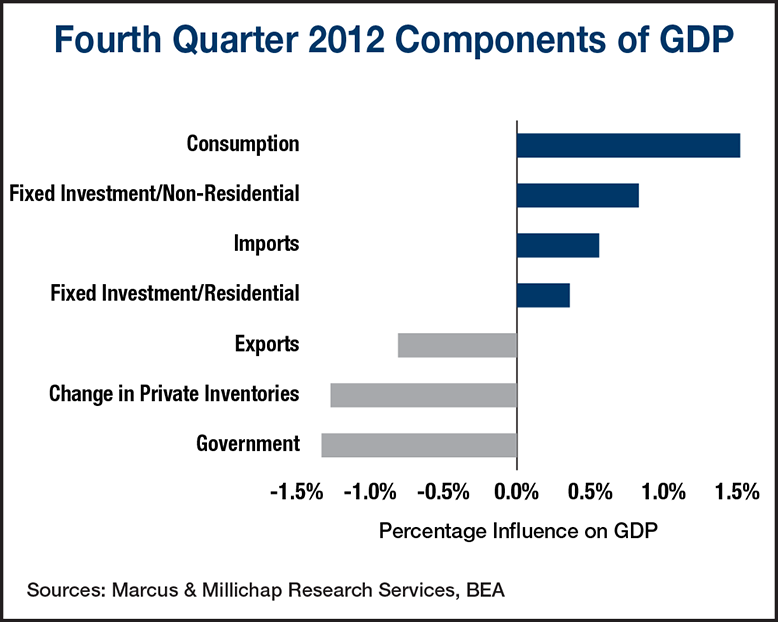 GDP ended 2012 on a flat note, slipping from a 3.1 percent gain in the third quarter to a modest loss of 0.1 percent in the fourth. The largest drag on the economy was an annualized 22 percent decrease in defense spending, an indication that the military is preparing for sequestration. Other major detractors from the figure were a decrease in exports and softer inventory accumulation. Both of these GDP components suffered from China’s slowing economic growth and the European recession. However, concerns over the eurozone debt crisis have mostly fizzled, and the area recorded only a modest 0.1 percent decline in GDP during the third quarter. In China, GDP growth accelerated in the fourth quarter for the first time in nearly two years, an indication that exports and inventory growth should contribute more substantively to U.S. economic growth in coming quarters. Several components of GDP continue to build positive momentum, including housing, which was absent as a contributor for several quarters. Fixed residential investment added 0.4 percent to GDP in the fourth quarter, the second highest reading in over two years. As the housing market gathers steam through 2013, contribution from this sector will rise. In addition, each home sale contributes an average of $5,200 in retail spending for things such as appliances and furniture, boosting the important consumer spending component of GDP. The savings rate jumped to 4.7 percent in the fourth quarter as a wave of bonuses and dividends were paid out ahead of the rise in taxes associated with the “fiscal cliff.” Some of these payments should translate to a healthier start to retail sales this year, helping offset the payroll tax increase. Strengthened consumption will support increased retail space absorption, tightening vacancies by 80 basis points to 8.6 percent. GDP grew by 2.2 percent last year, and gains in 2013 should surpass that level, helping create more than two million new jobs. While that figure is insufficient to dramatically pull down the unemployment rate, it will encourage hiring by office-using firms in rapidly growing industries. These companies will sign leases to add space, predominantly in gateway markets, pulling down the U.S. office vacancy rate by 80 basis points to 16.2 percent. This entry was written by marcusmillichap, posted on January 31, 2013 at 12:21 am, filed under Research and tagged Commercial Real Estate. Bookmark the permalink. Follow any comments here with the RSS feed for this post. Post a comment or leave a trackback: Trackback URL.